Robin Rath, another one of my coworkers from the MonsterWebDesign department, maintains Turino Interactive - Intuitive Design for the Web. His site not only looks impressive but has a Google Pagerank of FIVE! Also check out Rob's blog at AbnormalPawprint. Our cars are EXCELLENT gifts and fun for both children and adults. Check out our informational FAQ page for more info on the mini rc and some fun advice. Our pricing is the best on the net! The Vision: Our vision is to establish an indigenous, self-perpetuating, self-replicating, and self-sustaining cell based church movements. A great friend of our family, Nikomas Perez has been the youth minister at Ferguson Christian Church for exactly three years. He is married to Rachel, and has a beautiful daughter about 1 year younger than my daughter named Ashland. He is younger than I am, but a wiser man of God and also an all-around fun guy. Unfortunately, our church family recently got some bad news as he and his family are moving to a different church in Illinois. We are sad to lose him and his family, but happy at the same time because we know that this is what God is calling him to do. Check out the fabulous blog of Nikomas Perez. Good luck, Nik! St. Louis LoftStyle makes urban loft living easy with our artistic modern furniture design pieces from Mies van der Rohe, Eileen Gray, Bertoia, Josef Hoffman, George Nelson and Isamu Noguchi. We also have modern contemporary furniture like the artistic Le Corbusier Sofa and the elegant barcelona chair. Read more about our products. View the gallery of Trent Overton. We hope you enjoy browsing the Portfolio of photographer Trent Overton. This site and all images copyright © 2004 by Trent Overton. All rights reserved. Kate now has three blogs and links to a few forums. Graphics are available for desktop wallpaper as well as banners for use in forums or otherwise. 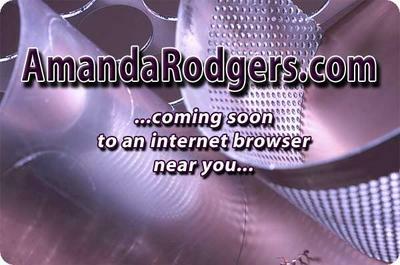 Coming Soon to an Internet Browser near you.. Learn about molly the clown and more! Currently Amanda is the Marketplace Guru. Jacqueline 'Jaci' Johnson is a newer coworker of mine. Two Beans in a Bucket is her site. Hey, Jaci, I'm linking to you. You should probably get your site back up and running. Update (2007/06/25): Here is Jaci's public photo gallery on Picasa. Jeremy Polen gets another entry because he maintains two sites. All this, and he is practically professionally indispensible. I think he works too hard. Jeremy's Wonderful Page of Intranets Fun!!! My job is the best. We are poised to take over the world of e-commerce. We may or may not have the best software product in the world [I'll keep my bias to myself] but we DO have the best team supporting it. Our clients have come to find out that this really makes all the difference. If you need a shopping cart to sell products online, the best place to look is MonsterCommerce. Check out the online storefront demo, shopping cart design and SEO features.